Photo of Lieutenant Governor Rosemarie Myrdal, Governor Ed Schafer, and cabinet officers. 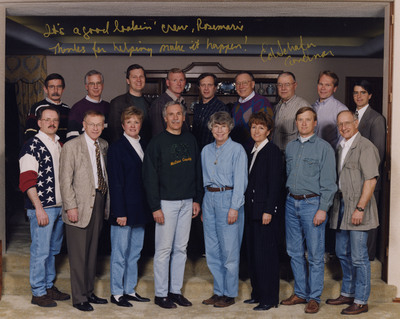 Caption by Governor Schafer reads: "It's a good lookin' crew, Rosemarie. Thanks for helping make it happen! Ed Schafer."